Replacement ice maker assembly. Genuine replacement part. This manufacturer-approved icemaker is for refrigerators, including Samsung refrigerator model RF267AABP/XAA-0000. Unplug the refrigerator and shut off the water supply before installing the icemaker assembly. Safely store any food that could deteriorate while the refrigerator is shut off for this repair. Ice maker DA97-05554A is an original equipment manufacturer (OEM) part that fits some Samsung bottom-freezer refrigerator models in the RF26-, RFG23- and RFG29-series. Ice maker DA97-05554A includes the ice mold, motor and wire harness.This ice maker doesn't include the housing with the ice level detecting arm.This part DA97-05554A is only the ice maker portion of Samsung complete ice maker assembly DA97-05422A. 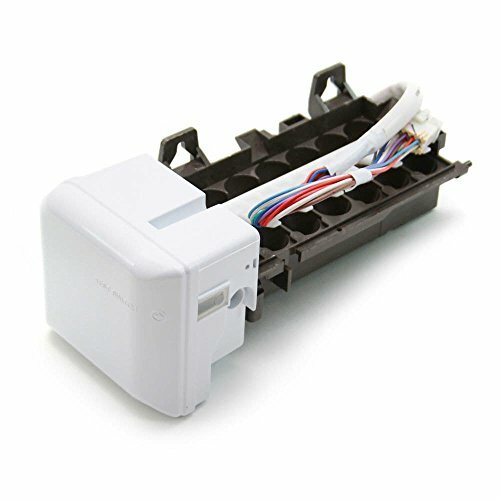 Ice maker DA97-05554A fits Samsung refrigerator models RF267AAWP/XAC, RF267ABBP/XAA, RF267ABBP/XAC, RF267ACRS/XAA, RF267ABPN/XAA, RF267ACWP/XAA, RF267ABRS/XAA, RF267ABRS/XAC, RF267AABP/XAA, RF267ABWP/XAA, RF267AABP/XAC, RF267AARS/XAA, RF267AARS/XAC, RF267AASH/XAA, RF267AAWP/XAA, RF267ABWP/XAC, RF267ACBP/XAA, RF267ACPN/XAA, RF26VABBP/XAA, RF26VABPN/XAA, RF26VABWP/XAA, RF26VACBP/XAA, RF26VACPN/XAA and RF26VACWP/XAA. It also fits Samsung models RFG297AARS/XAA, RFG297AARS/XAC, RFG297AAWP/XAA, RFG297AAWP/XAC, RFG295AAPN/XAA, RFG299AARS/XAA, RFG295AARS/XAA, RFG295AAWP/XAA, RFG297AABP/XAA, RFG297AABP/XAC, RFG297AAPN/XAA, RFG238AZRS/XAA and RFG295AABP/XAA.